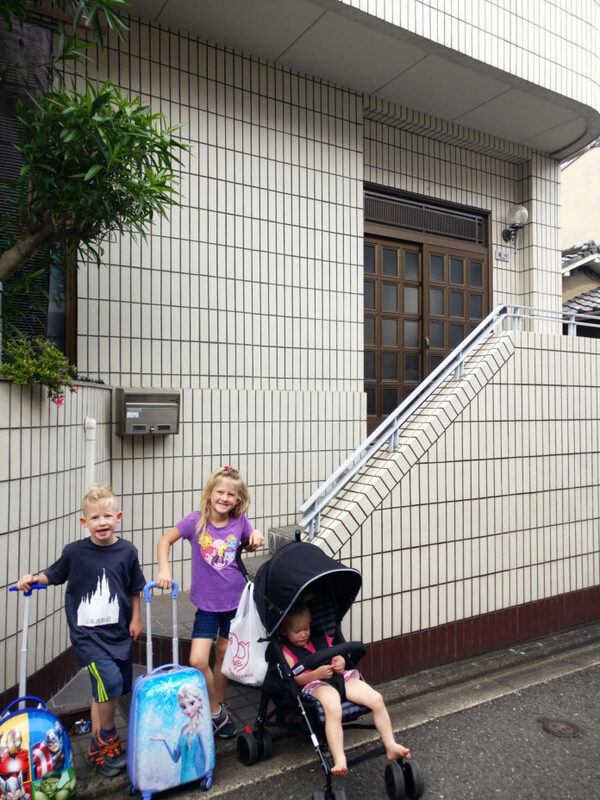 Having never been to Japan, choosing a place to stay was a daunting task. Typically I spend weeks, or months, depending on how spur of the minute trip it is, researching the place we are going. I attack it from a historical perspective, and a cultural one, including figuring out all the top attractions and things to do (post coming soon on methodology). But, preparing for our Japan trip was exhausting. Mentally and emotionally I was going through some things that were extremely hard to process, and I told Gabriel I wasn’t up for it. In fact, I wanted to cancel the whole trip, but in doing so we’d have been out a huge chunk of cash. 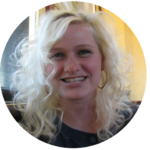 Ultimately we decided to sit with the plan, in large part because Gabriel felt it would help aid in the healing process. It definitely did. To put it mildly, my heart wasn’t in it. But, as it turns out, this little gem we found on airbnb near Fushimi Inari-Taisha (though it had it’s faults – read on) ended up being in an amazing location. I don’t think I would have rather stayed anywhere else in the area. We were close to two different JR Rail trains which gave us access to the rest of the city, and within walking distance to the Fushimi Inari-Taisha Shrine, which is easily the most recognizable and visually dramatic shrine in all of Japan. The home itself is really large, and not just by Japanese standards. It has a very unassuming exterior with paper doors, but inside is a delight. 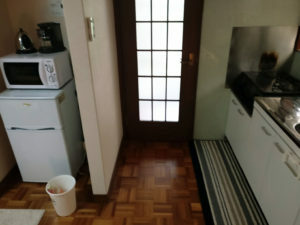 There was a front room (or possibly a third bedroom), separate toilet and tub (I just can’t call a Japanese tub contraction a shower), a living room/dining room, kitchen and two bedrooms! One of the bedrooms was up a very large, very steep staircase, but it was separated from the rest of the house which offered the children a place to play and stretch their voices. 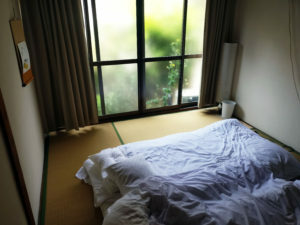 As was the case with one other airbnb’s we stayed at in Japan, this home did not have actual beds. We slept on flat, covered, thick pads, akin to a camping mat. Our children didn’t know the difference, but we had to pull an extra one or two from the closet to make sleeping bearable. Pillows were also tiny and not supportive, extra pillows did not have pillowcases provided which was a bit unsettling. All the same, these are the things I can live with. We always aim for proximity to the action when it comes to choosing a place to stay. This place was large, safe, and very convenient. It was also close to a grocery store, and a great small little restaurant run by a husband and wife that we came to love. But, there were also a few things that were a bit of a turnoff, to say the least. The toilet room was covered in tiny rock pebbles. There is a raised platform over the rocks to stand on, or rest your feet on, while using the toilet, but just take a minute to think about what that means. Think about how dirty your home toilet gets. Think about the men and boys in your family. Now, think about how you would clean the base of your toilet and the rocks surrounding the base of your toilet. All the smells. The separate room housing the shower and tub room was destroyed. The paint was peeling, the wood was rotten, and it was gross. 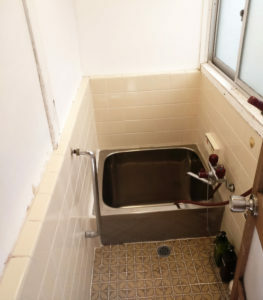 Click on if you don’t know what it’s like to shower in a Japanese tub. It wasn’t dirty, but it wasn’t clean. There were areas that were visibly dirty like around the oven and undersides of the sink, including a huge burnt mark on the wall. I figure if it’s noticeable it should be cleaned or replaced, and it’s not like I come into a new airbnb or hotel and perform a white glove test. There was also a huge ant problem. Ants were everywhere. Any wrappers or tissues left on the ground were breeding grounds. Gabriel got a terrible ear infection during this trip and we applied our tried and true method of Garlic Herbal Ear Oil. All drainage from his ear was immediately sensed by the ants and a infestation 5 feet long was upon us. They were mostly confined to the one bedroom off the kitchen. Now to give the hosts some credit, what we also noticed is that a lot of the things we saw in the home were previous suggestions from other guests. 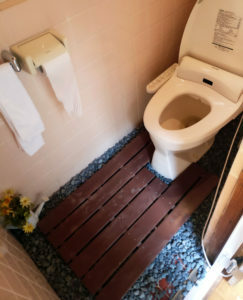 For instance, one guest complained that they didn’t have a toilet seat warmer, which is standard in Japan. They fixed this suggestion and there was a working bum warmer during our stay. There was also another complaint that there were no umbrellas in the home, but during our stay we found several umbrellas in a stand by the door. So, although this place wasn’t necessarily the nicest place, and definitely needed some attention in areas, it’s definitely worth a shot to inquire with the host if they’ve made any of the changes we suggested as it is such a great price, location, and size. 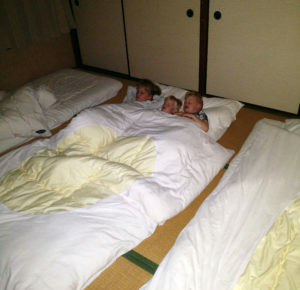 ► For Kids: Yes, especially if you have more than one and would like an excursion with a separate bedroom. The size of this place is hard to come by in Japan. Looking to go on a trip soon? Use our airbnb Referral Code to save $40 on your first trip! ► Nap-Time Version: Great location, great price, great size. A bit smelly, dirty, and neglected. 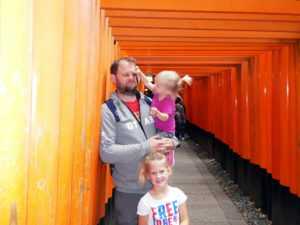 Read about all our other adventures in Kyoto, Hiroshima, Tokyo and check out our Diapers On A Plane Japan Vlog. 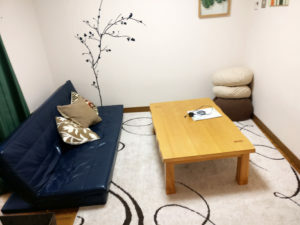 Where did you stay in Kyoto? Was it better than our experience? Or, do you think a few hundred ants wouldn’t scare you away? We want to hear about it!